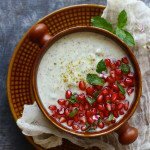 Pomegranate Raita is a delicious raita recipe prepared with mint, curd, and pomegranate. Learn how to make anar ka raita in a few simple steps. Blend together the mint, coriander, garlic, green chilies in a mixer using water, into a chutney-like paste. Transfer the paste to a bowl and set this aside. In another bowl, whisk the curd using a wire whisk ( buy it here ), add 1/4 cup or so of water to get the desired consistency. Whisk the curd well to ensure that no thick lumps remain. Next, add the salt, sugar, spices in the yogurt, and whisk it all together until well combined. Then, add the mint paste in the yogurt. Stir gently, to combine. Taste and adjust the seasoning accordingly. When ready to serve the raita, add the pomegranate pearls and stir to evenly combine. Serve Pomegranate Raita chilled or at room temperature.